Within the literature for piano trio, I have always been troubled by the dominance of the piano. The piano leads, especially in the romantic literature, the musical journey, and, with its capacity for grasping thick chords, defines the harmony. The strings, and especially the cello remain for long stretches in the background. I have discussed this with Claus Christian Schuster, the incomparably knowledgeable pianist of the Altenberg Trio, and the latter encouraged me to engage myself with this issue. What I wanted to achieve was an equal integration of all three instruments in the musical texture, with only occasional exchanges of leadership role. The trio, in four movements, was written in 2005, and is dedicated to Claus-Christian Schuster and the Altenberg Trio. The first, succinctly written, movement is energetically engaging; the second is a thoughtful nocturne, beginning and ending with a regularly repeating note, like a bell heard from afar. The third movement is a quick humorous intemezzo. In the Finale we hear twice a switch from energetic 4/4 time to dancelike 6/8. Especially in the last two movements I was concerned with achieving a leggiero character, a texture of sparingly applied brush strokes – perhaps also because the observation of a certain viscous heaviness in much contemporary music can trigger in me a degree of odium. "Few biographies embody so thoroughly the theme of artistic enlightenment and ecstasy progressing to downfall and ruin, as does that of Robert Schumann (1810 – 1856). Gloominess and finally his incarceration in an asylum for the insane caused not a few contemporaries to doubt his creative powers during his final years in Düsseldorf. Claus-Christian Schuster, pianist of the Altenberg Trio, points out, however, that during this time Schumann created at least a quarter of his oevre, spanning about twenty-five years in toto. He adds that the Third Piano Trio in G Minor, Opus 110, written October 2 – 9, 1851 bears witness to anything other than declining creative powers – traditionally accepted verdicts notwithstanding. Schumann’s last piano trio is considered his most gloomy and burdened, yet both full of contrast and monothematic. The challenges to the performer are most demanding: compulsory, yet seemingly contradictory metronome indications; an enormous expressive scale ranging from melancholy heaviness all the way to "will-o’-the-wisp pizzicati and the effects of a bizarre soundscape" (Schuster) at the end of the first movement. At the beginning of the second we hear a long-drawn duet of cello and violin, a quiet love song (described as such by the violinist Christian Tetzlaff), followed by motivic flashbacks to the first movement, and concluding with feverish stretto culminating in a thunderous release. The third movement (scherzo, c minor) beginns with a variety of tempo indications: "Rasch" is followed by a soothing "zurückhaltend bis zum langsamen Tempo", which is followed by another acceleration to "Sehr rasch",. This corresponds to the juxtaposition – characteristic for this composition – of contradictions: a fecund yet variable emotionality, which encompasses gloom and torment as well as allowing allusions to couplets and jolly horseback rides. The Finale ("Kräftig, mit Humor, G-dur") has been faulted time and time again – not a few voices from the world of criticism have referred, and continue to refer to it as "laboured", "garrulous", "forced", or whatever other adjectives may be pressed into service by the fault-finder. Schuster sees in them all no more than "the ear-trumpet from Endenich" (the locale of Schumann’s incarceration), which wanted to earmark boisterousness and rapidly changing pictoral scenes as diagnostic proof of a mentally disturbed condition d’artiste. Music theorists, who typically love order above all else, wanted nothing to do with such a richness of expression, which some relate to the worlds of a Jean Paul, with its intense life and great variety, all the way to boisterousness and (compositionally controlled) daredevil acts. Thus they miss out (here we gladly quote this from Carl-Christian Schuster’s inimitably perceptive essay) on the unfathomable syncopations and the liberating jubilation which comprises the conclusion of Robert Schumann’s last piano trio." Our special thanks for this CD goes to our producer, Veronica Kraneis, and to Irmhild and Helmut Reiße. Vera Osina, born in Kazan, Russia, received her first piano instruction at the the age of five in the Kazan State Conservatory "N. G. Zhiganov" from Marina Mihailova. In 2010 the pianist graduated with distinction from the Conservatory. In addition, she studied organ and harpsichord, and worked as vocal coach. She has won prizes at various international competitions as soloist and chamber musician (St. Petersburg, Kiev). Since childhood she has performed solo and chamber music concerts in Russia (St. Petersburg, Cheboksary, Ulyanovsk, Yoshkar-Ola), and after 2010 in Germany. 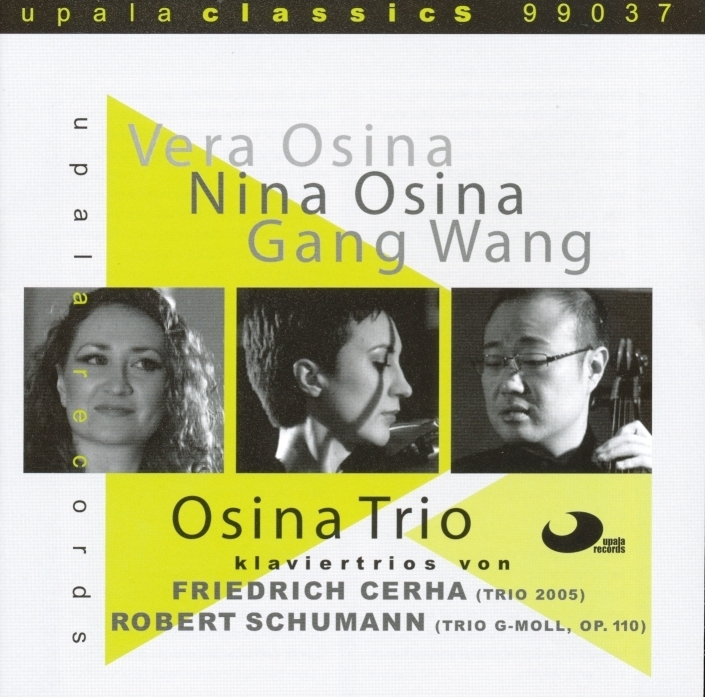 In November 2010 she founded the Osina Piano Trio, together with Nina Osina (violin), and Gang Wang (violoncello). Nina Osina, born in Kazan, resides in Germany since 2008. First violin instruction at the age of six at the special music school of the Kazan Conservatory, with Elena Quinn, and later with Lenar Aikaev. 2010 graduated with distinction from the Academy of Music of the City of Kassel, Germany, under Jewgeni Schuk (1st Concertmaster of the State Theatre, Stuttgart). Prior to that she graduated with distinction from the N. A. Rimsky-Korsakov Conservatory, St. Petersburg. Her instructors were Ilya Ioff, Inga Dzektser, and Alexander Richter. As violinist she impressed at various international competitions. Numerous prizes, including the "Republik Youth Competition" (Ufa, Russia); International Youth Competition" (St. Petersburg, Russia); "Uralsk International Violin Competition" (Uralsk, Kazakhstan); "The 7th Takasaki Internatioal Art and Music Competition" (Takasaki, Japan). This was followed by appearances as soloist with violin concertos by Mozart, Sibelius, and Vivaldi (Chamber Orchestra “La Primavera”; State Symphony Orchestra of Tatarstan; Youth Orchestra of Kazakhstan; Orchestra of the Music Academy Kassel ). She is also violinist with various orchestras and chamber music ensembles. Nina Osina already has a large repertoire and performs regularly in solo and chamber music concerts in Germany and Russia. Gang Wang, born 1978 in Beijing, received nine first prizes at various competitions in China. Since 2001 he has resided in Germany. 2010 he graduated with distinction in Kassel; in addition he successfully completed a degree in music education in Frankfurt. His teachers included Joanna Sachryn (Cologne), Professor Martin Rummel (New Zealand), Professor Gerhard Mantel (Frankfurt), and Professor Wen-Sinn Yang (Munich). Major achievements were performances of concertos by Haydn, Saint-Saëns, Shostakovich, and Beethoven (Triple Concerto), with various orchestras. Assistant cellist for the State Orchestra in Kassel, and for the Göttinger Sinfoniker. In 2002 Gang Wang received the scholarship of the Peredur Foundation, Kassel; in 2005 he received the prize of the Dr. W. Zippel Foundation. He is also member of various chamber music ensembles, e.g. the A Quattro Quartet, the Billroth Quartet, and the Spohr Chamber Orchestra. His main emphasis has been his activities with the Osina Piano Trio. Gang Wang currently plays a cello made by Roland Erichson in Kassel in 2011, a copy of an instrument by Jean Baptiste Vuillaume from 1857.